This is the first game in the Lode Runner series. 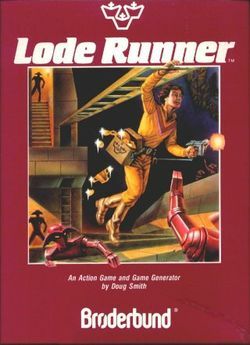 For other games in the series see the Lode Runner category. Lode Runner broke the mold for platform/ladder computer games when it came out. Not only did it include 150 different levels for the player to tackle, it also included a complete level editor that allowed players to continue the fun long after the 150 levels were beaten. What started as a side project for Doug Smith while he attended college, became a phenomenal success after Brøderbund bought the rights to publish his game for the Apple II, on which it was developed, as well as just about every other system that could handle it. Lode Runner captured many players' imaginations, as well as their dollars, so it went on to great commercial success. The first sequel to appear was Championship Lode Runner which contained 50 of the most difficult levels designed for the original by fans, and intended for play by experts only. Following Championship, many sequels and ports, including an arcade version, were developed to cater to new and old fans of the series alike. Even to this day, the license is still alive with developments like a version of Lode Runner for the Nintendo DS. Hudson Soft brought the first 50 levels of Lode Runner to the NES, albeit slightly altered due to vertical resolution restrictions. The Famicom version of Lode Runner was the tenth best selling Famicom game released during 1983 and 1984, selling approximately 1,100,000 copies in its lifetime. Hudson later brought all 50 levels of Championship Lode Runner to the Famicom as well, staying more faithful to the original level designs by providing vertical scrolling in addition to the horizontal scrolling, although the first level is different. Hudson is still the current development license holder in Japan. Irem developed an arcade version of Lode Runner, which was followed by three sequels. Most of the arcade levels consisted of the original 150 levels distributed among the various arcade versions, while some levels were entirely original. Irem brought many of their arcade inspired levels to the Famicom Disk System under the names Super Lode Runner and Super Lode Runner II. Lode Runner has been presented in such a variety of ways that the premise changes from version to version, but the object of the game is always the same. Simply put, you are a (police man, criminal, treasure hunter) who is attempting to (recover, steal, gather) all of the (loot, boxes, gold) from the (crooks, security guards, island natives). You're pretty much free to make up any story that you like. You control the main character with a joystick. 2 buttons: Press the left button to dig a hole to the left, press the right button to dig to the right. You must collect every box, loot, or gold to make the escape ladder appear and advance to the next stage. You must avoid contact with every other person in the stage. Dig holes to trap enemies or fall through them to reach lower levels. Holes fill themselves in after a period of time. Enemies that are trapped in the holes are briefly removed from the stage, but eventually return. This page was last edited on 20 February 2018, at 07:42.